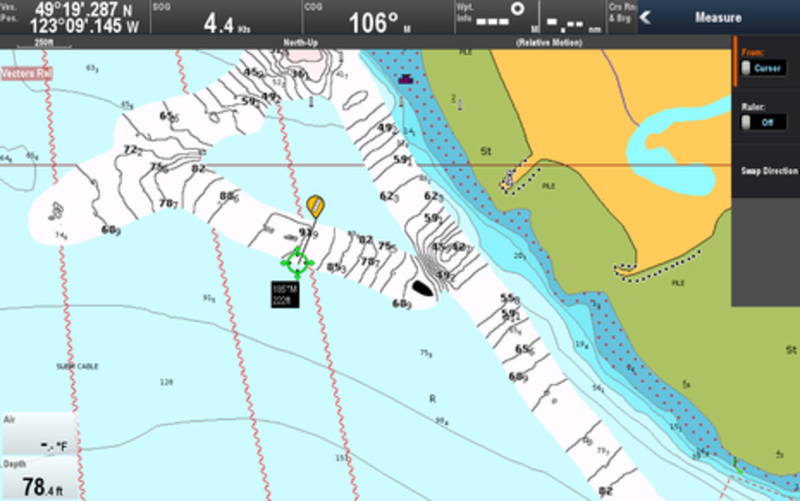 In this part 2 entry, I'll share my experiences with the new Navionics SonarChart Live display and Dock-to-dock Autorouting, and also discuss R17's new NMEA 2000 Audio app and other improvements. 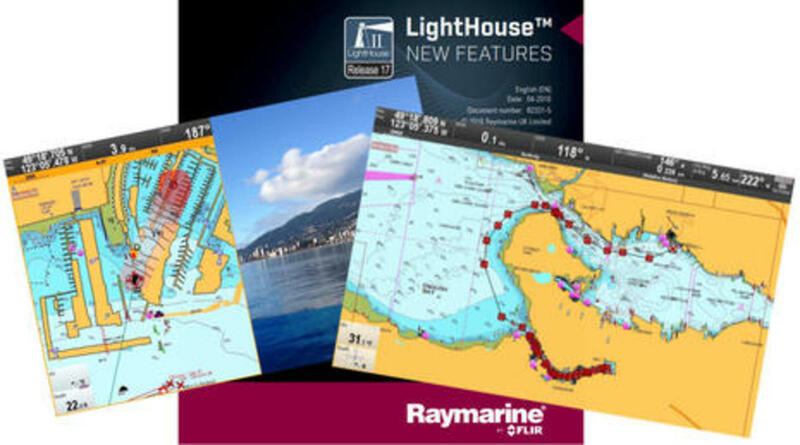 When Raymarine&apos;s significant LightHouse software Release 17 became public last Thursday, I&apos;d already had a chance to test a beta R17 version on the water and was able to discuss the new global weather display feature along with the LightHouse WiFi capabilities that can make weather data access fairly easy. 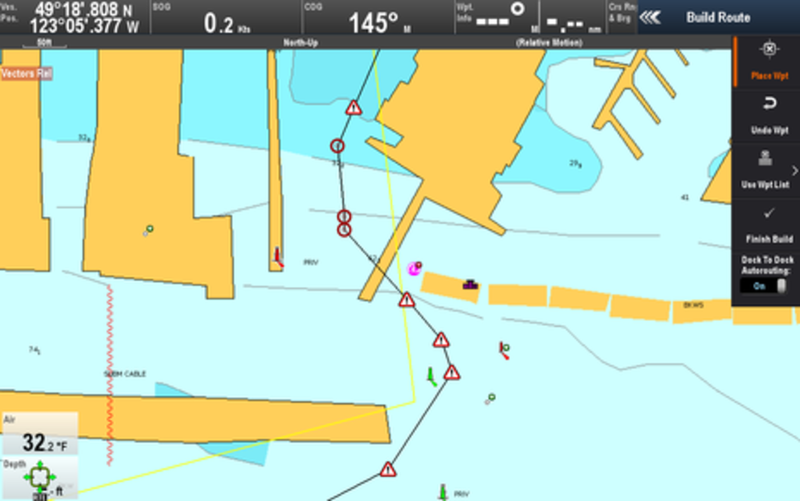 In this part 2 entry, I&apos;ll share my experiences with the new Navionics SonarChart Live display and Dock-to-dock Autorouting, and also discuss R17&apos;s new NMEA 2000 Audio app and other improvements. 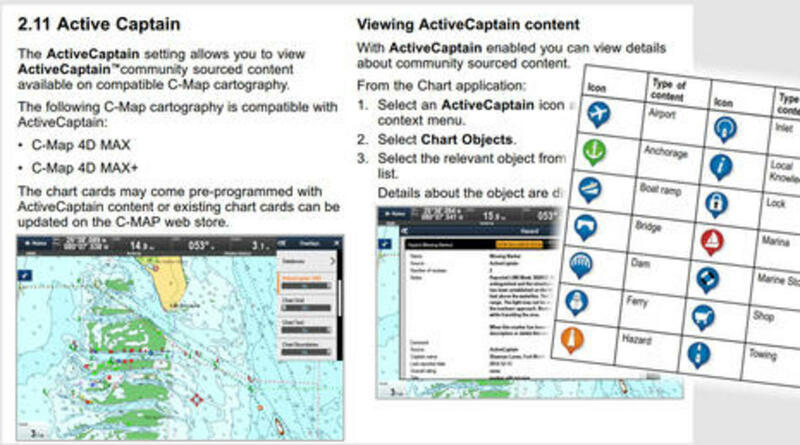 It&apos;s important to understand that you need a Navionics chart card with a current Freshest Data subscription in order to use SonarChart Live and the vastly improved autorouting (as warned about above). 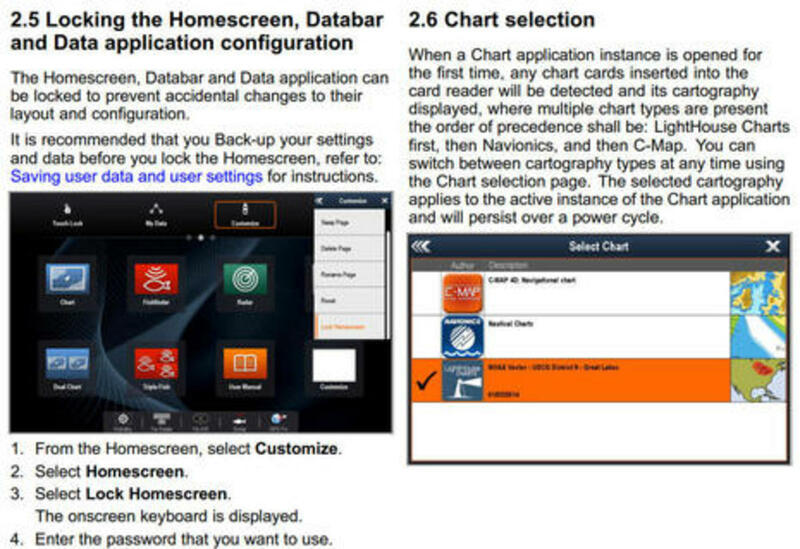 In fact, you probably need to update the data on your card to get the charts that work with Dock-to-dock as well as the correct "eligibility file" (and looking at your card with the Navionics Chart Installer program is a another way to check your subscription status). 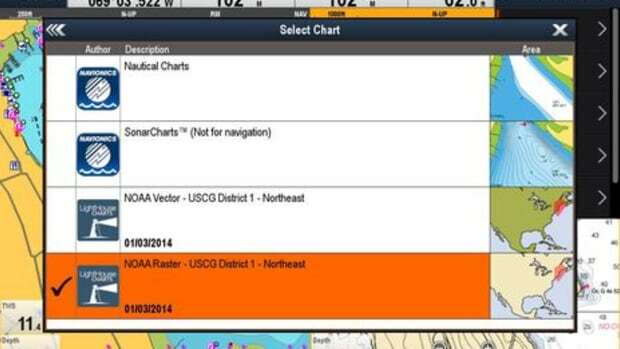 By the way, the charts on an expired Navionics card will still work for all other tasks, and the original Navionics autorouting will continue to work on Ray MFDs until the end of 2016. But as seen on Journey&apos;sRaymarine c125 above, I did have the right card to test the new Navionics features during my first cruise of the season. 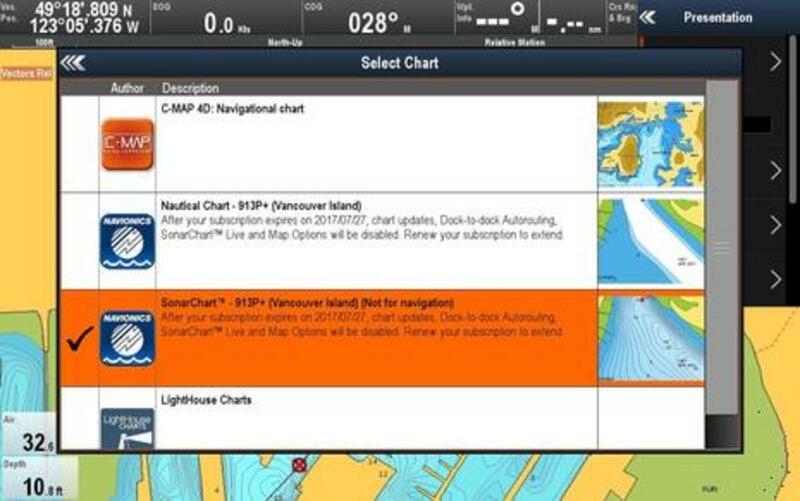 Let&apos;s recall that while SonarCharts have been available on the Navionics Boating app and on some multifunction displays for a while, Raymarine was first to integrate with the app so that sonar logs collected on an MFD can be easily added to the public charts. That&apos;s how Ben helped chart the Barred Island anchorage above in 2014. 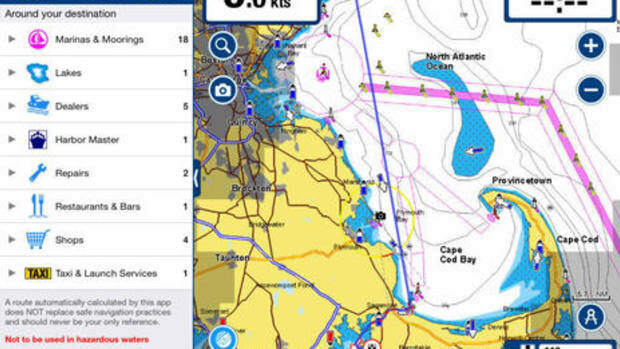 Later the Navionics app got SonarChart Live (SCL), which meant a tablet and smartphone with depth input could paint rough raw data bathy maps in real time and even more easily upload them to Navionics for further processing into the master SonarChart database. Ben tested SCL using a Vexilar WiFi fishfinder, and his iPad mini screens above show how the raw Live data differed from the existing SonarChart (which was later improved with his data). 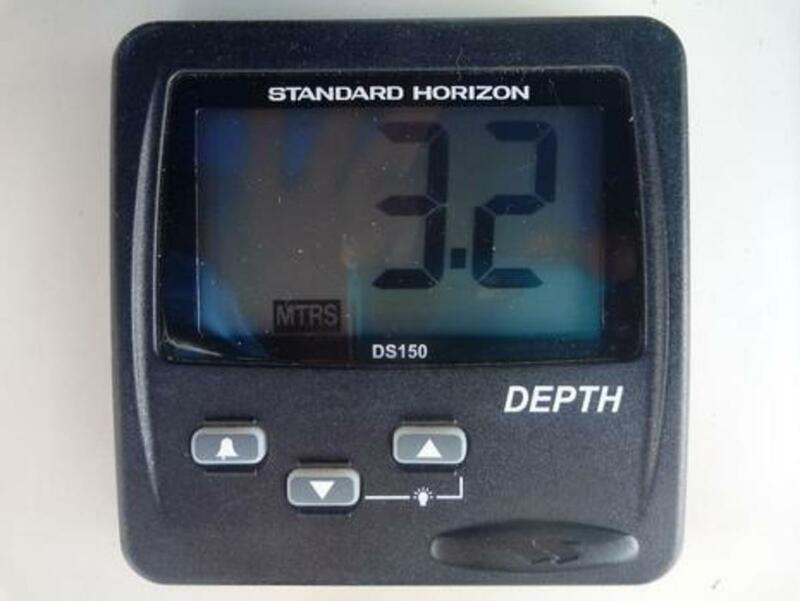 My depth sounder is a basic but reliable Standard Horizon DS150 with a thru-hull transducer and the ability to output NMEA 0183 depth data, which I have multiplexed to my c125 MFD along with AIS and DSC data. Strangely, it only outputs data when the SH display is set to show depth in meters. But SonarChart Live can purportedly use any depth input the Ray display sees, and it seemed to work fine in my testing. You can see SonarChart Live guesstimating a bottom contour swath as I took Journey out of my Mosquito Creek Marina slip on Vancouver Harbor&apos;s North Shore and headed west under the Lions Gate Bridge to the mouth of the Capilano River (Google Map here). Though it&apos;s a popular coho salmon fishing area, the season hadn&apos;t begun and I pretty much had the area seen above to myself on a beautiful day. Note how red is SonarChart Live&apos;s default shading color to differentiate it from the regular chart or SonarChart blue shading it overlays, and the shading intensity is correlated to depth based on a user setting. 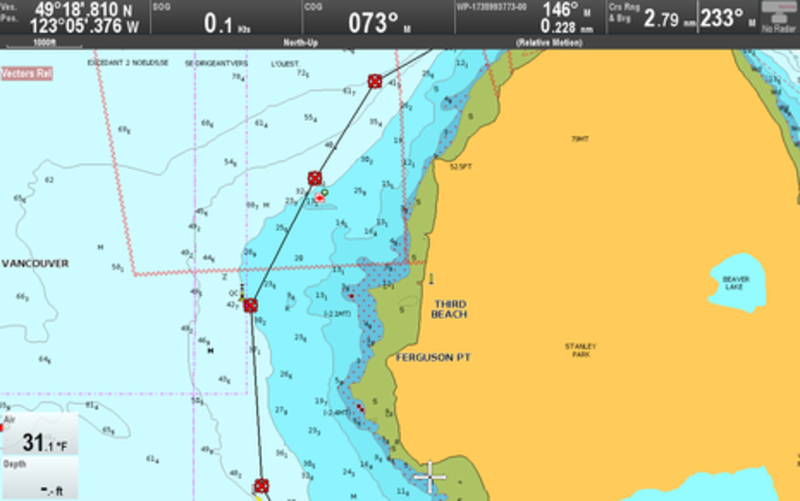 Since Ben tested SonarChart Live, the Navionics app has gotten the ability to correct the Live data for a nearby tide prediction station (as well as the transducer&apos;s depth), and that&apos;s also true in Raymarine&apos;s implementation. So when I switched on Tide Correction in the Advanced Map Options menu, the data was corrected about 10.2 feet to show low tide soundings like regular charts. You can also control SonarChart Live overlay opacity as shown on the smaller screen above (which was taken from the R17 New Features PDF). Notice how I was using little opacity -- that is, lots of transparency -- when leaving my marina so I could also see the underlying charted depth bathymetry and the above water structure. By the time I took the screen below, I had turned the opacity up to 100%. 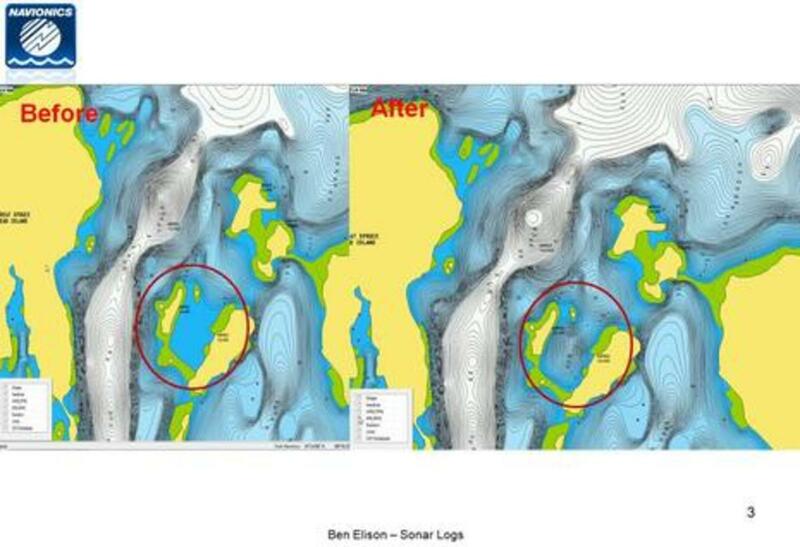 I guess I should not have been surprised when I measured the width of the SonarChart Live bathymetry swath at about 220 feet wide because it looks similar to what Ben saw on the app. 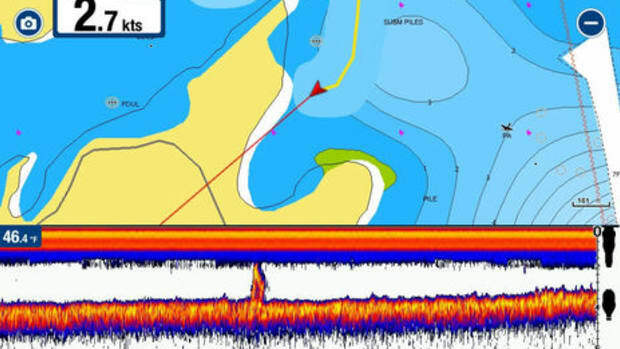 In fact, according to Navionics a 50 meter swath is the standard convention for surveying that has been adopted by the industry including other depth collecting features like Navico Insight Genesis, Humminbird Autochart, and Garmin Quickdraw. 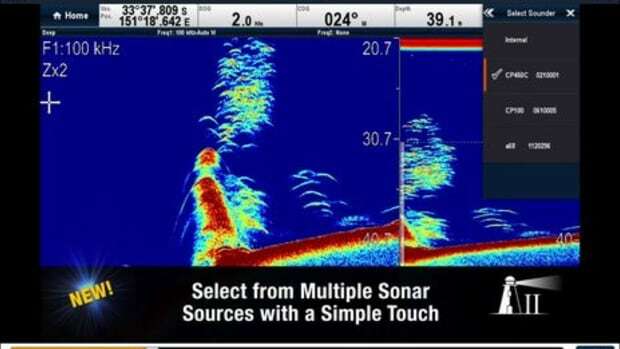 There&apos;s a lot of guesstimating going on -- especially if you&apos;re in shallow water with your transducer only seeing a narrow section of the bottom -- but you can improve the accuracy a lot by making multiple passes. 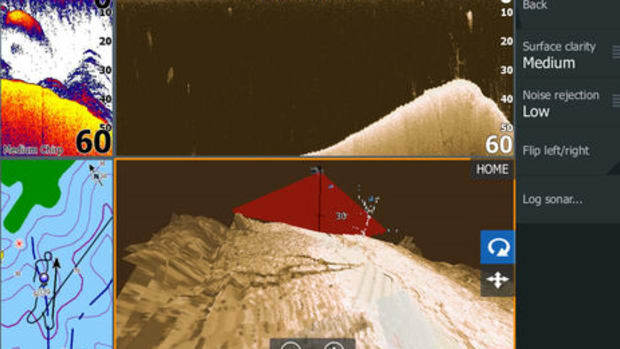 Plus, if you contribute your sonar logs to Navionics, the data will be rationalized with all other data collected in the same area. Incidentally, most of my SCL data was collected at under 6 knots, but I did go up on plane to about 17 knots as I moved past the mouth of Capilano River (shown as the green low tide area in the bottom right of the screenshot chart above). SonarChart Live kept laying down contours no problem. You can see that the soundings I created were similar to the underlying chart values so I felt some assurance as to its accuracy. Back at the dock the next step if you want to share your data is to either sync the Navionics app with the Raymarine MFD or take your chart card home and run it with Navionics Chart Installer program. Your data should be processed and added to the SonarChart community data within about a week, and it seems quite predictable that Raymarine will eventually make the upload process even easier using the MFD WiFi discussed in Part 1. Overall I really like SonarChart Live. 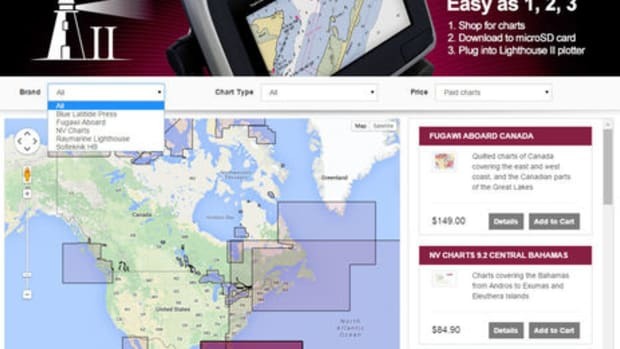 It is easy to use and I think most useful to create your own chart detail for fishing, diving or choosing the best anchoring spot. 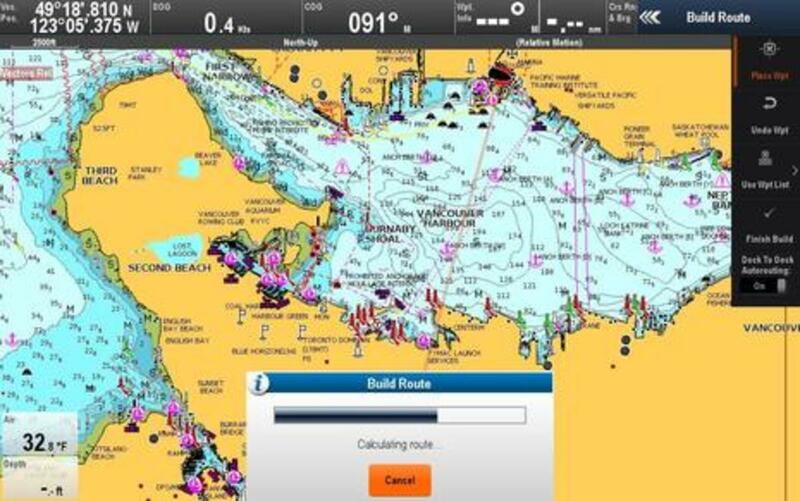 Turn on the Navionics Dock-to-dock Autorouting now in my Raymarine c125 Build Route menu, pick my start and end waypoints, and then wait for the route to magically build -- that&apos;s it! There&apos;s some history here. 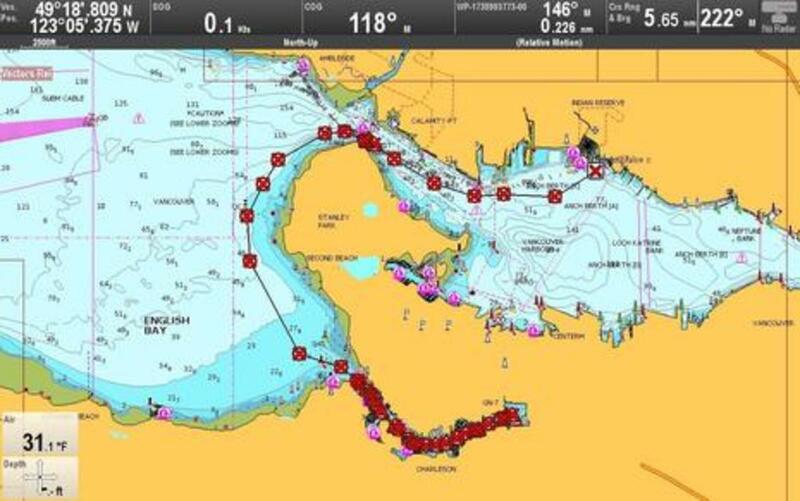 Almost two years ago in Lighthouse 11, Raymarine offered Navionics autorouting (if you were using a Navionics card) but I was underwhelmed by the results. 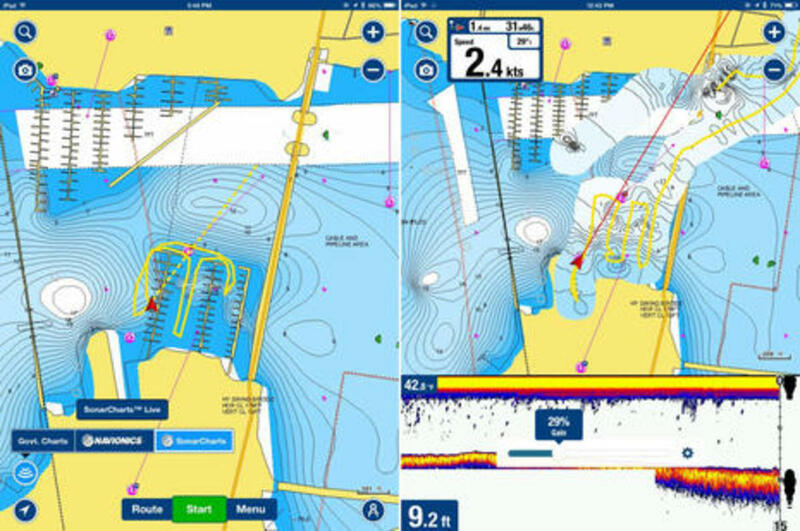 By contrast, Navionics Dock-to-dock is a pretty amazing and award-winning replacement autorouting technology that Ben comprehensively explored when it came to the Navionics Boating app last December. 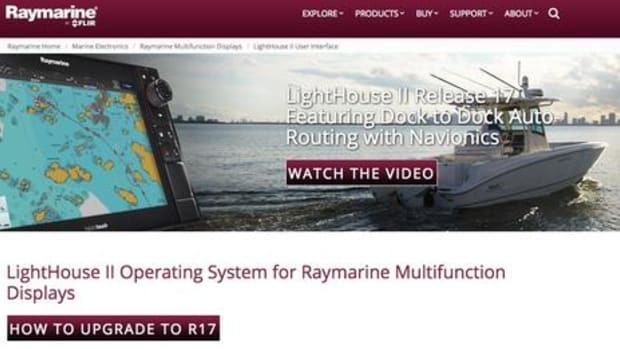 The Raymarine version of Dock-to-dock in R17 was previewed last fall at METS and it may have taken this long to launch because it&apos;s not a trivial feature. Here I&apos;ve built my first route from just outside my marina breakwater to the end of False Creek. This is a scenic 7.2 nautical mile trip that I often entertain guests with because of the protected sections at the start and finish. 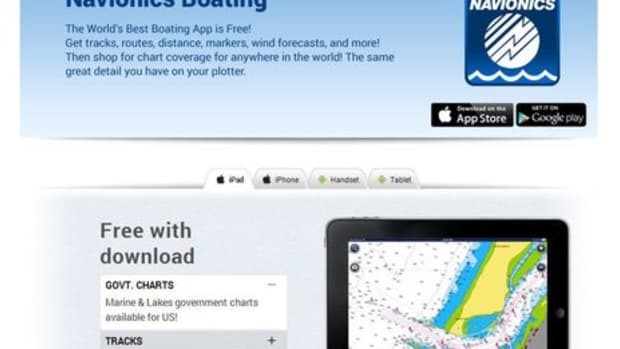 Navionics told me that the MFD software and Boating app algorithms are pretty much the same, and what you see on the chart is actually two routes overlaid on each other. I wanted to see if my MFD would calculate the same 43 waypoint route as the iPad, and it did exactly. Dock-to-dock did a great job respecting the lateral buoys near Cambie Bridge and elsewhere, but I didn&apos;t like how it guided me east of the QC west cardinal buoy, which literally means "safe water is to the west of the buoy." In this case cutting the corner a bit wouldn&apos;t be a critical error but the route is too close to the rocks for my liking. 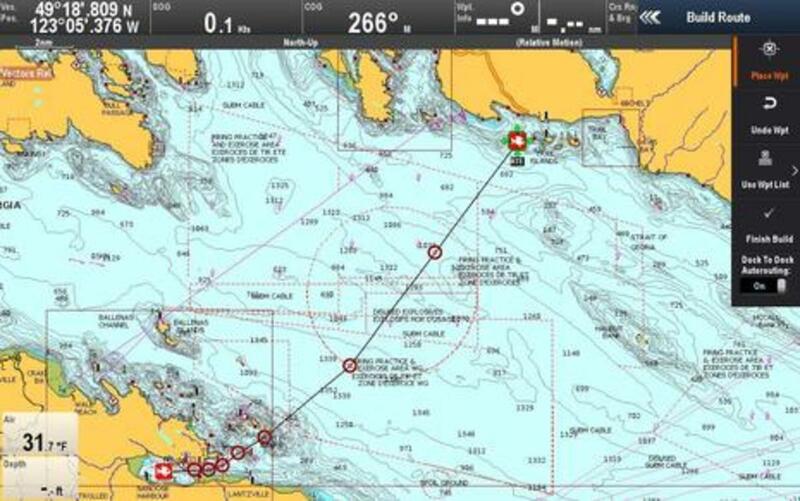 Note that route editing is different on the Ray MFD than on the Navionics app. On the MFD you can manually edit waypoints (quicker with a touchscreen than non) but unlike the app, the MFD-based route won&apos;t automatically re-calculate legs after a waypoint is moved. 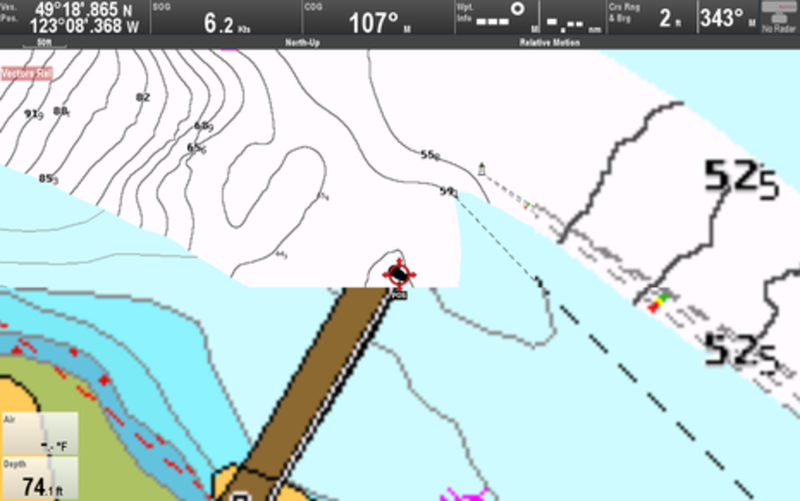 Another Dock-to-dock difference from the Navionics app is that on a Raymarine MFD you can&apos;t use a Point of Interest (POI) like a marina for a route start or end. You also won&apos;t see a list of POIs around your destination or get an immediate trip distance, time and fuel burn (though those values are available on the MFD if you have the right data windows set up and the new route is selected). Hopefully Raymarine&apos;s implementation of Dock-to-dock will catch up with the Boating app version, but I have some suggested improvements for that one too. There are also minor anomalies, like where Dock-to-dock becomes "dock-through-dock" at my Marina. This is a pretty obvious error that hopefully most boaters won&apos;t fall for. As has been often discussed, no autorouting can be completely relied on. Think of Dock-to-dock as your junior navigator; it&apos;s nice to have the help but you won&apos;t trust them without checking their work! Overall I&apos;m pretty excited about Dock-to-dock. It is miles ahead of standard autorouting, it&apos;s a huge time saver, and it&apos;s great to have it on my Raymarine MFD. 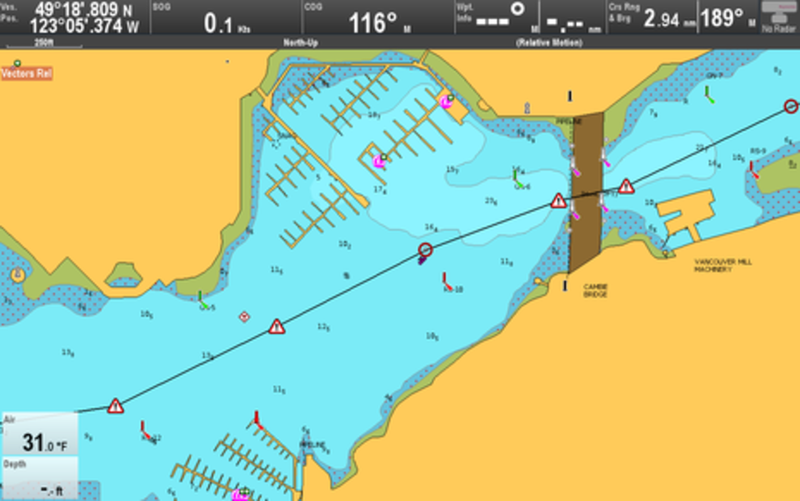 Of course Raymarine also supports C-Map cartography -- right up to 4D-MAX+ -- and with R17 that includes the ActiveCaptain cruising POI info that C-Map now adds to its chart cards. We discussed this and Furuno AC support on Panbo (bottom of entry), and here&apos;s a good Ken Cirillo video on the subject. Judging from the LightHouse R17 New Features manual above, Ray is using a wider selection of POI icons than normally seen on ActiveCaptain displays, but so far it does not seem possible to filter them so that you only see the ones you want. 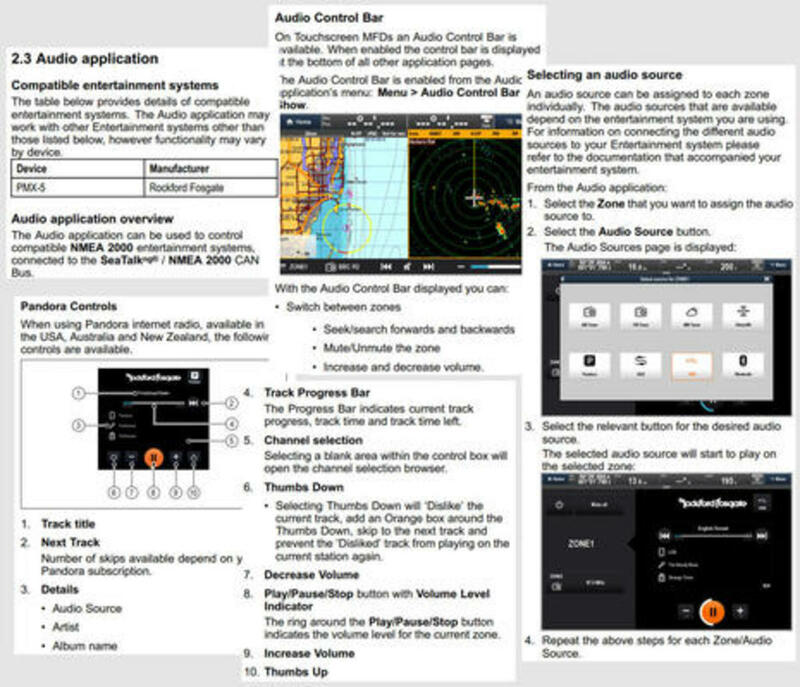 The new NMEA 2000 Audio app that comes with LightHouse R17 was foreshadowed when Raymarine announced MFD control for the Rockford Fosgate PMX-5 in February. Then Ben discussed how this and other N2K stereos might bring competition to the boat integration trailblazed for years by Fusion, though he was skeptical that it could be done as well just using NMEA&apos;s new entertainment PGNs. Well, so far the Rockford Fosgate PMX-5 is only the stereo listed as fully compatible with the new LightHouse app, but Raymarine says it&apos;s all done with the standard N2K message library and that other stereo manufacturers can follow suit. The Audio app does looks quite complete -- as seen in part by the snips from the R17 New Features PDF above -- and it includes the PMX-5&apos;s intriguing ability to use two different audio sources with different speakers zones on your boat. So Raymarine seems well prepared to work new N2K stereos announced by JL Audio and most recently by Prospec Electronics. 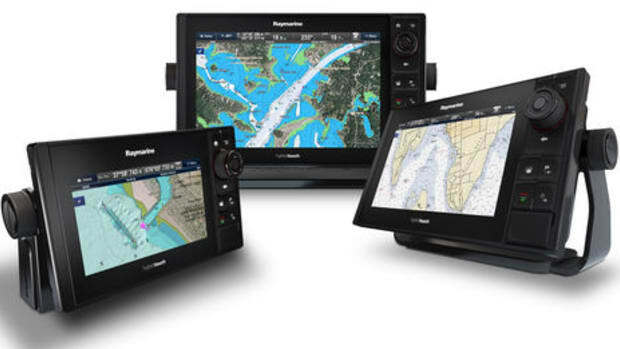 And don&apos;t fret about Raymarine keeping up with new Fusion Entertainment marine stereos; LightHouse R17 also includes numerous updates to the Fusion-Link audio app, including support for new audio sources like MTP, DAB+, and built-in Bluetooth, as well as deeper zone controls and maintenance functions. As shown in the slide above from Ray&apos;s r17 powerpoint presentation, the LightHouse Switch Panel app is improved and now able to display in a split-screen window. Raymarine&apos;s digital switching has become quite sophisticated as also described recently on Panbo, but its use is still largely limited to boat builders. However, there&apos;s also a new Homescreen and Databar Locking feature that will be appreciated by many boaters like me who enjoy letting crew use the electronics to a certain extent (or sometimes accidently mess things up by ourselves ;-). And LightHouse&apos;s new ability to choose available chart types by itself even if you&apos;ve switched or added cards sounds good for all. These features are explained below in the New Features PDF, which is available in full here along with the 1GB R17 update. All in all, it&apos;s a pretty remarkable free system update and we look forward to hearing how it works for you.